On May 12, 2016, on an overcast cool morning, a grassroots movement took a stand on the lawn of the U.S. Capitol. Hundreds of nurses from around the country gathered to bring attention to patient-nurse ratios. But more importantly, they gathered to show their fellow healthcare workers that they would no longer be silent when it came to patient safety. From that grand but humble beginning, it was clear that a movement was afoot, and plans immediately began to continue the momentum. 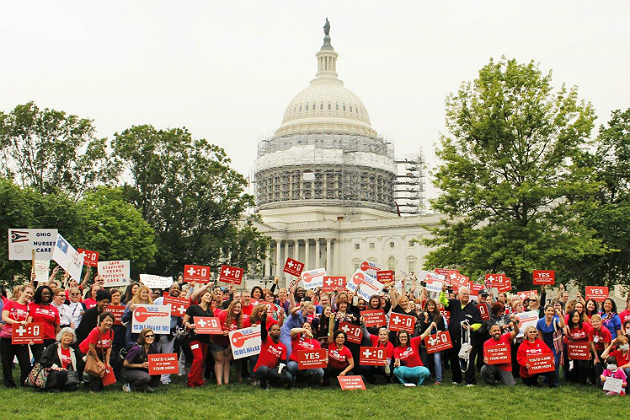 This year's Nurses Take DC rally will be held Friday, May 5, again on the lawn of the U.S. Capitol and hopes to draw hundreds more nurses, healthcare providers and members of the general public. The goal of the rally is to again draw attention to the need for federally mandated safe nurse-to-patient ratios. They are calling for the passing of the National Nursing Shortage Reform and Patient Advocacy Act (S. 864) and the Nurse Staffing Standards for Patient Safety and Quality Care Act of 2015 (H.R. 1602), which are scheduled to be introduced in Congress this month. These bills provide strong language that will mandate nurse-to-patient ratios similar to the current laws enacted in California in 2004. "The goal of the grassroots movement is to encourage all nurses and nursing organizations, regardless of level of practice or specialty, to unify and fight for core nursing issues that affect the majority of nurses and patients," said Jalil Johnson, MS, BSN, ANP-BC, PhD(c), rally organizer and national director for the Show Me Your Stethoscope Foundation. "The ultimate goal is to empower the largest group within the healthcare system — a 'nation of nurses,' to become more active in healthcare policy, to take control of their work environments and ultimately improve patient care and outcomes." This is not the first time such an endeavor has been undertaken. On March 31, 1995, more than 35,000 nurses marched on Washington for, sadly, very similar issues. Their march was spurred by massive layoffs of nurses, who were being replaced by unlicensed personnel across the county. Led by Laura Gasparis Vonfolio, RN, PhD, the rally demonstrated that nurses could have a voice that would be heard if they just joined together. Nurse-patient ratios continue to be one of the largest issues in nursing. Although many institutions provide adequate support for the nursing staff, anecdotally, this is not the trend in most facilities. As healthcare financing continues to be stretched thin, nursing services continue to be asked to do more with less. Unfortunately, the patient is the one who suffers in that equation. The research repeatedly demonstrates that when there is appropriate nurse staffing, there are reductions in medical errors, patient mortality, lengths of stay, preventable events such as falls, pressure ulcers and infections. But more importantly, as the nation faces an epic nursing shortage, increased staffing boosts nurse retention and job satisfaction, which all contribute to better patient care. In an effort to not only rally the troops, but also educate them, a Patient Safety Conference is being held May 4, the day before the rally. One component of the conference will center on legislative actions. "The goal this year between the meet your legislator session and the rally is that we are able to give nurses the knowledge and confidence to feel empowered enough to go home and contact their legislators about the bills," according to conference speaker Cathy Stokes, BSN, RN. "To provide them with the tools they need make the calls, write the letters and have the conversations that we as nurses are not naturally inclined to have. To help nurses realize that if we unite and use our voice collectively, then we can and will make a difference. "Nurses do not need to be afraid of advocating for our patients or our profession beyond the bedside. Together we can do this, we just have to find our voice." Although the Nurses Take DC rally may have started with humble, slow beginnings, it is clear the movement is getting attention and gaining strength as nurses feel more empowered to speak up. "Since last year's rally, we have seen an uptick in nurses becoming more active online and on the ground, starting new local safe staffing initiatives, writing more and sharing their experiences, and generally becoming more active in discussions around healthcare policy making," Johnson said. "Anecdotally, I would say that nurses are starting to feel more empowered by the #NursesUnite concept and becoming more involved in self-advocacy. This was the goal of last year's rally. "In the current political climate, we have not seen any new safe staffing legislation passed. However, on the state and local levels, we see more nurses becoming involved in advocacy as well as several organizations proposing policy and legislative changes that favor improving nurse work environments and patient care outcomes."